I simply MUST share my favorite new Christmas Tradition with you. If you do something twice during the holidays and you enjoy it, it becomes a tradition, right? THIS is how the Wallace Family of Katy, Texas rolls! 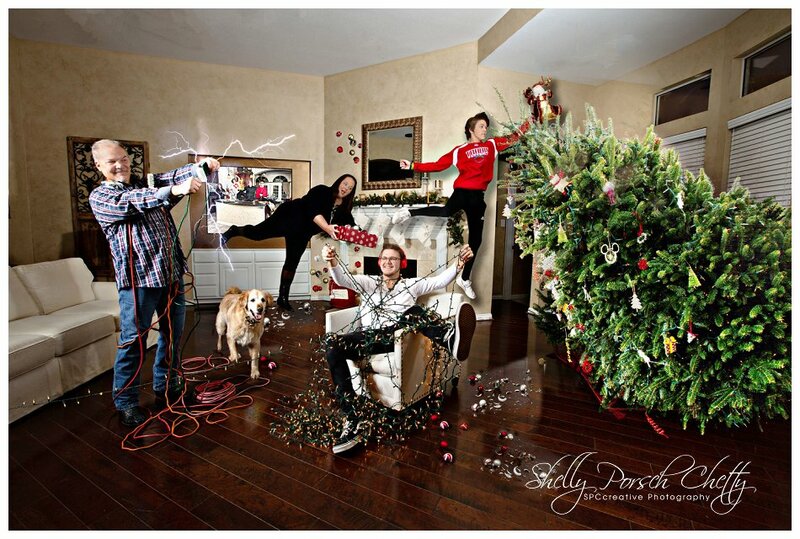 Seriously, they’ve got to be the FUNNEST Christmas Family in Texas. You see, It all started when Mom, Jenny, called in 2017 looking for a fun and unique family Christmas card. They had a general concept in mind, but needed a pro to help them pull it off. Oh my goodness! It was exactly the project that had been bubbling in my own brain for quite a while, and suddenly these people just called me to create it! How does that even happen? Did I ever tell you how much I LOVE my job? As we began planning for our session, I reached out to one of my photography instructors and friends, Dan McLanahan. 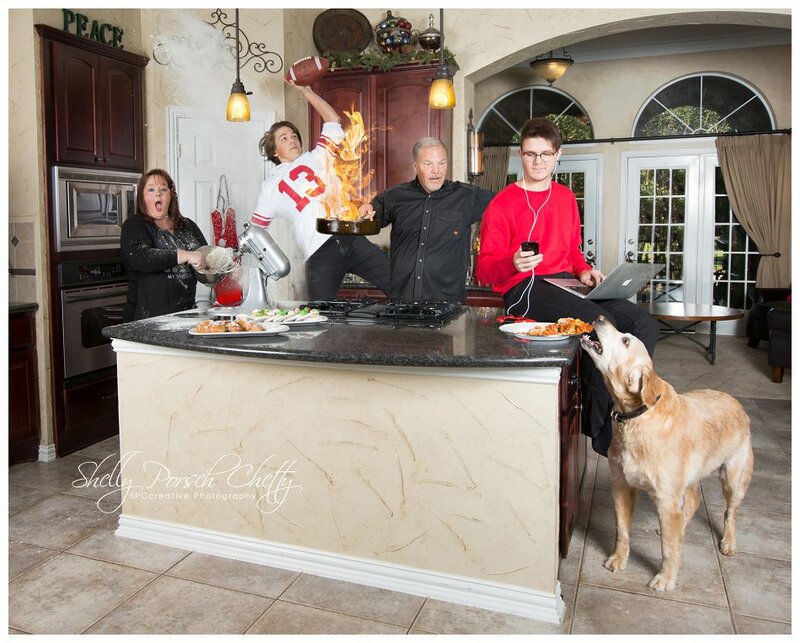 Dan is very well-known in professional circles for his amazing skills and talents, but my brain at this time was all-consumed by the reknown “Friday Night Food Fight” composite that he had created a year before. Click on this link to check it out! Dan gave me some pointers to help make our session go smoothly, and he also offered a gentle but extremely helpful critique during the post-production stages of Christmas Kitchen Chaos 2017. The magic of a project like this comes in compiling several photographs until one composite image is complete. I don’t know what part of this scenario I enjoyed the most. It could have been Scott’s flaming skillet. (Yes we used real fire). Or Jenny’s flying flour which looked so realistic because the sons hid behind the island throwing flour and mashed potato flakes into the air until we captured our perfect messy cloud. Maybe it was Braden’s athletic skills catching a football mid-air with his LEFT hand so that we could still see his face –HOW MANY TIMES? Josh’s feigned boredom with the whole scenario absolutely cracked me up because it couldn’t have been further from reality. In fact, he offered keen thoughts, insight, and even served as a voice-activated lightstand throughout the session both last year and this year. 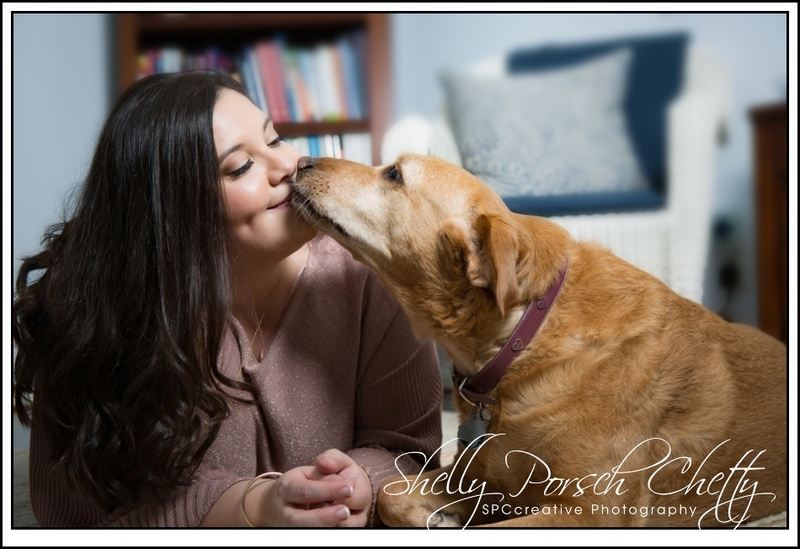 However, the story I LOVE to tell about this shoot is about the family dog, Brinkley. This dog is so well-trained that he absolutely refused to steal the lasagna off the counter. In order to make that scenario happen, we had to send dad to another part of the house while Jenny and the sons coerced and tempted him. This was my first ever attempt at a relatively complex composite image, and it was so much fun. The Christmas card recipients started asking what this year’s card would look like, and the Wallaces quickly realized that they couldn’t ever go back to a traditional smiling family portrait card. When they called me this year, we sat down together and brainstormed until we came up with a new concept. The family has actually experienced a couple of real-life falling Christmas tree incidents, so they knew that their friends and relatives would understand the significance. Everyone maintained their basic persona from 2017. Jenny’s tripping over her own enthusiasm, and so surprised that she’s practically juggling the ornaments as they smash to the floor. Josh is once again absorbed in his technology and light untangling mess. Braden’s adding Santa to the top of the tree — Elf Style. And of course we’ve got Scott, once again about to burn down the house with his Griswold-inspired electrical connection. We even included last year’s card on the television screen at the back of the room. Best memory from this year’s photography session? The pure thrill on the guys’ faces when they got to actually throw glass ornaments up into the air, allowing them to smash on the ground. Josh said it was the one thing that you’re always told not to do. But on this one day we shattered ornaments on the floor and made a royal mess. 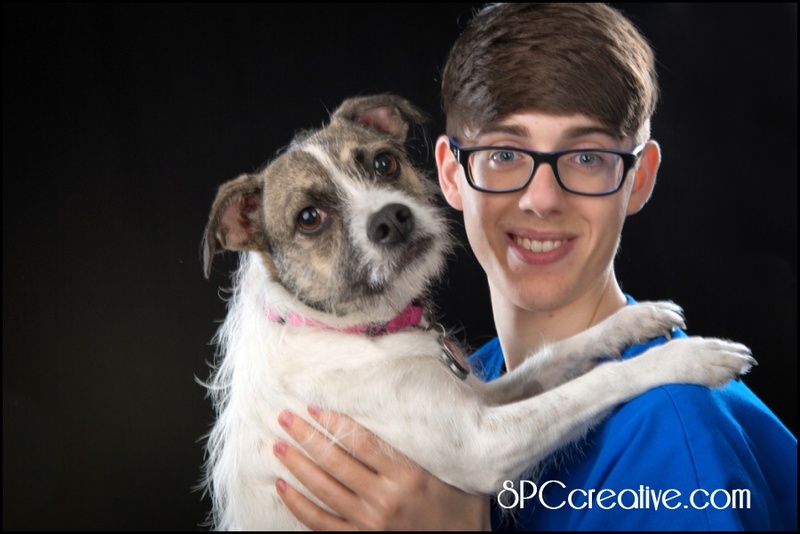 Merry Christmas from SPCcreative Photography via The Wallace Family. I will let one little secret out of the bag. We’ve already started planning for 2019. What will it be? I’ll never tell. 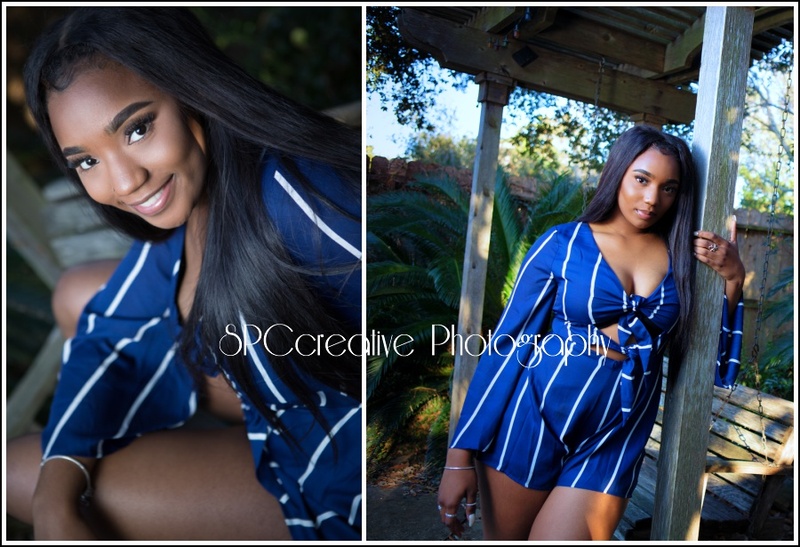 Keveney Evanne is one of those people who just draws you in with a feeling of calm confidence all wrapped up with a big, bold, energetic twist. And after spending some time with her, I left feeling refreshed and confident. Now, if THAT wasn’t backwards! After all, as a photographer I consider a large part of my job to be putting my client at ease and making HER feel comfortable enough to bare her soul for my lens. In this case, it’s almost as if the energy was reversed. That really comes as no surprise, though, because Keveney IS The Energy Wizard. and I was delighted to work with her as she re-branded her personal coaching business, Keveneyevanne.com. Now, I’ll be the first to admit that in talking with her to plan her photography session, I was a little bit — okay, a good bit — out of my element. After all, I’m just a small town gal from Midland-Gosh-Dern-Texas who never was even exposed to concepts like chakras, auric cleansing, or universal law. The theories always intrigued me but I truly knew nothing of them. Ha! It wasn’t hard at all. Keveney’s brand is solid and grounded because she works with high-level professionals who don’t mess around. Still, she is serenely uplifting. She uses a palette of deep rich plum and violet along with natural elements, calmexpressions peppered with joyful invitation. 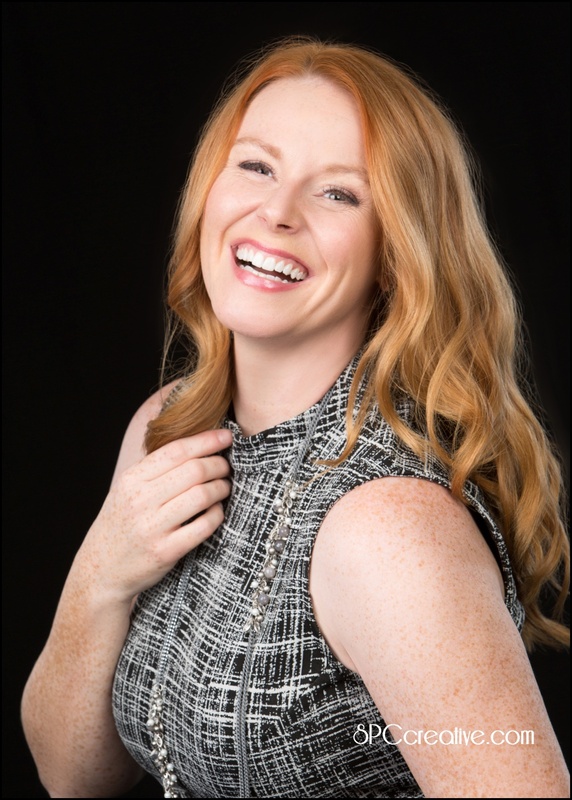 Keveney describes herself as a free spirit who had achieved a wildly successful life with a thriving legal career, beautiful home, loving husband, two great dogs, and more. Still she became disenchanted, so she started to wander. She didn’t just aimlessly amble around until she found something palatable. She set aside her legal practice and took on adventures that could conceivably become another “Eat, Pray, Love” genre novel. She practiced yoga in Costa Rica. She cooked alongside award-winning Native American chefs and built a sweat lodge with shamans in New Mexico. She studied with a world renowned animal communicator at a horse rescue in the Texas Panhandle. She learned about ancient healing and energetic technologies… And she played on the beaches of California. 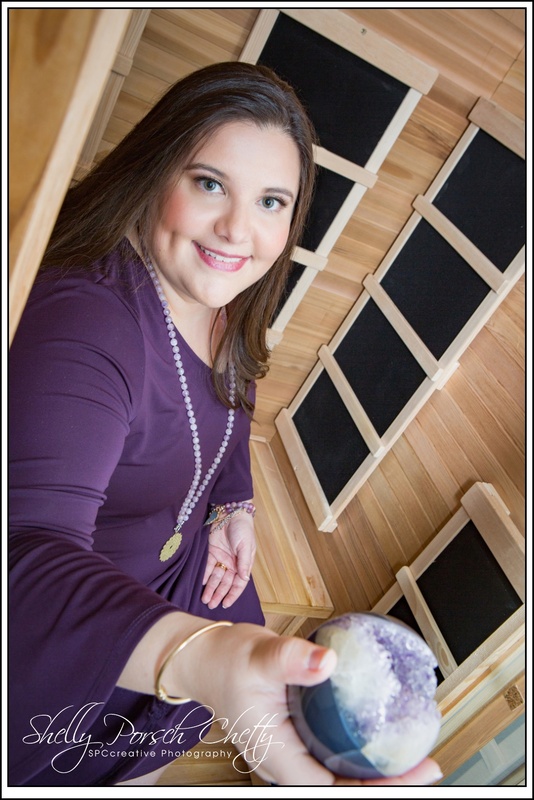 Now settled back in Houston, she puts all that she has learned together to help others move past their history to a different and fulfilling mindset. I loved working with her — and have learned so much just by hanging out with her for a while. It will be fun to watch her prosper along with her clients. Visit her new website to learn more. This is Brandon. 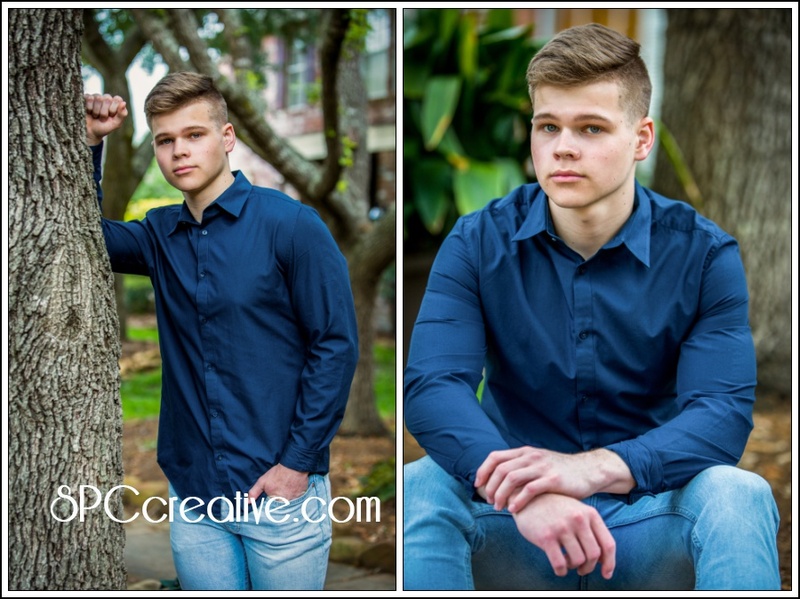 He’s graduating in just a few short weeks from Kempner High School, and I’m so glad that we were able to photograph this handsome young man. 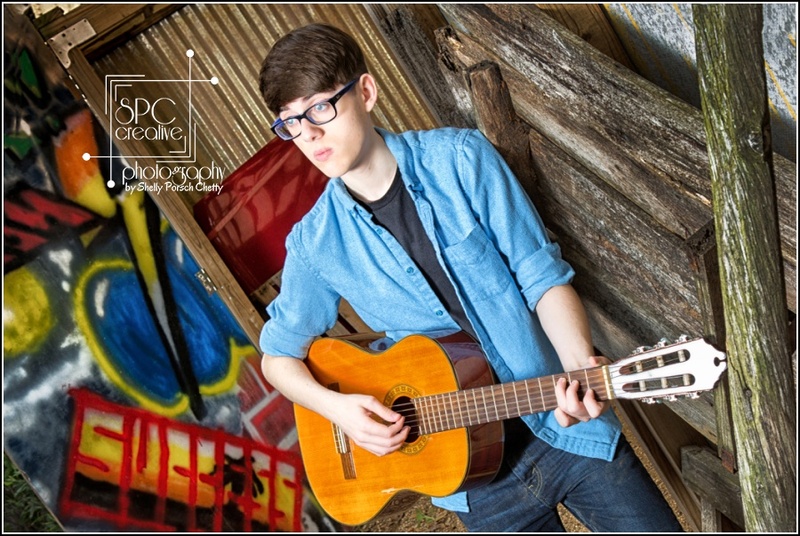 Planning his senior portrait session presented quite a challenge. He was scheduled to come in last fall, but because of Hurricane Harvey, our entire studio, both inside and out was a shambles. He and his mom graciously and patiently offered to wait while we mucked out and rebuilt our flooded home and studio, and we felt certain that we’d be ready to roll before Spring Break. Then spring rolled around, and because contractors and supplies have been in such short supply, we were nowhere near ready. BUT — I had committed to photograph Brandon and by-golly, we were going to make that happen. I took it as added incentive to start whipping my studio backlot into shape. By the time his newly scheduled appointment rolled around, we had about half of our sets refurbished. Our landscaping was still a big mess for the most part. YET — with creative camera angles and a lot of hard work, there is always a way. 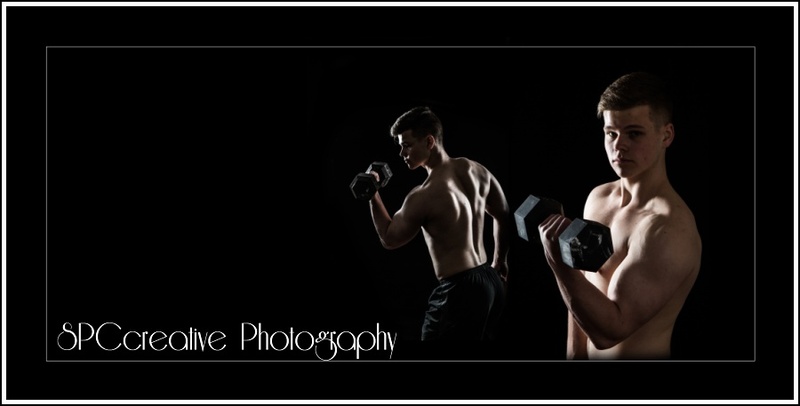 My absolute FAVORITE images, though, were the ones we created to highlight his weight lifting. 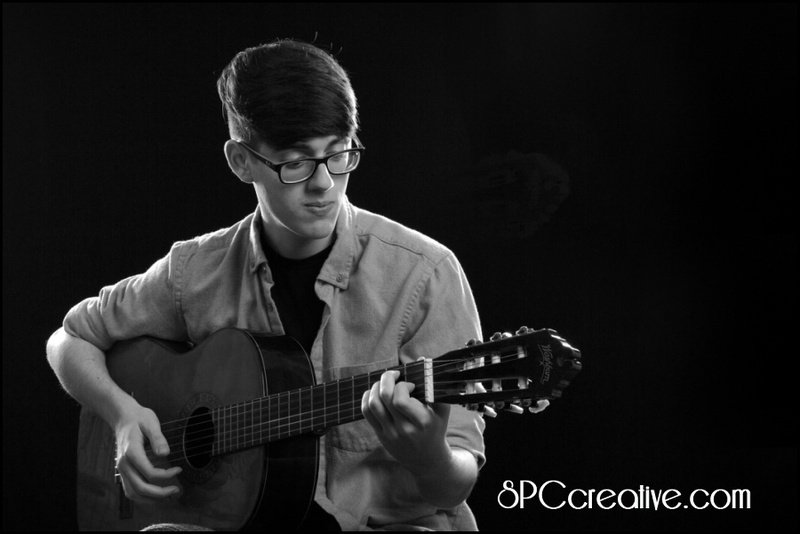 I managed to rig up a makeshift studio in an empty room, and I’m so glad we did. THESE simply couldn’t have come out any better. I love working with dramatic lighting patterns! I also LOVE the fact that we managed to catch a sweet “mom-kiss” before everything wrapped up. 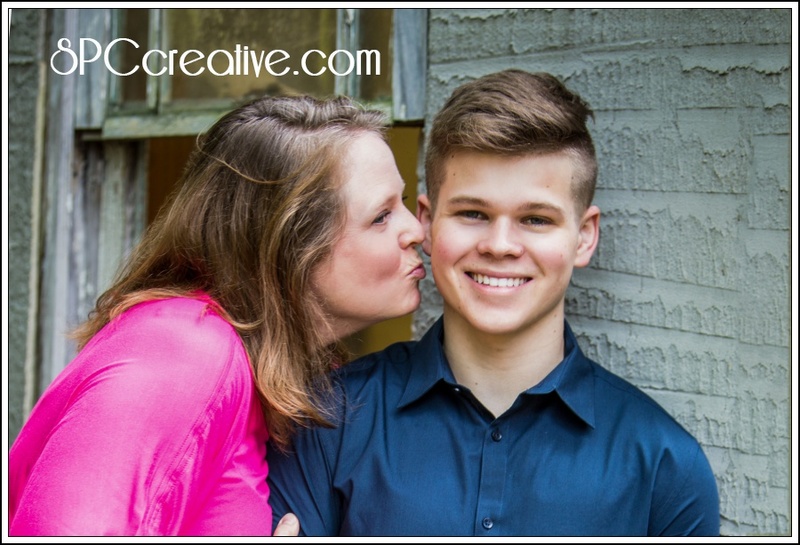 Brandon just might miss his mother and her home-cooking when he heads off to UT San Antonio in the fall — and I KNOW that she will miss him. This fun image should make the road home seem just a little bit shorter. 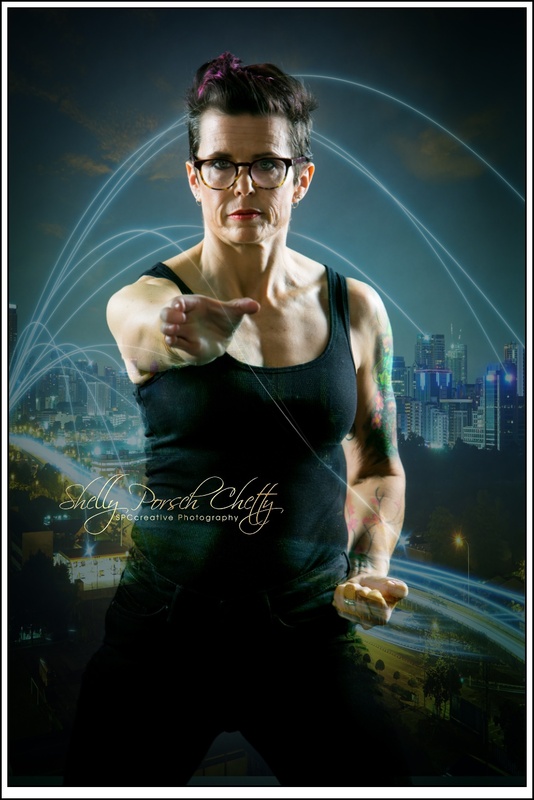 Did you catch my last post about the Inner Superheroes Revealed project? If not, Click HERE to read it. I am not by any means finished with the project. I will continue drawing out the fire of bold and powerful women in Houston and across the country. Do you think may be you should participate? YES you should. You and your besties absolutely should, and there are several ways we can make that happen. Just call the studio and let’s do it. But first, check out these fabulous women of Superheroes Revealed Part II. They are all gorgeously powerful and very exciting. We’ll start with Nicky. Her fearless bravado prevailed long before I ever met her. The first thing I ever heard about this wild Canadian woman was that she was going to walk on the wings of an airplane WHILE IT WAS IN THE AIR. Sure enough, she did it. She loved it. She wants to do it again. I wouldn’t be surprised if we didn’t see her start taking on stunt rolls for movies. C’mon somebody, write a movie script that calls for a gorgeous blonde to be climbing around on the wings of a plane in flight. We’ve got your gal. 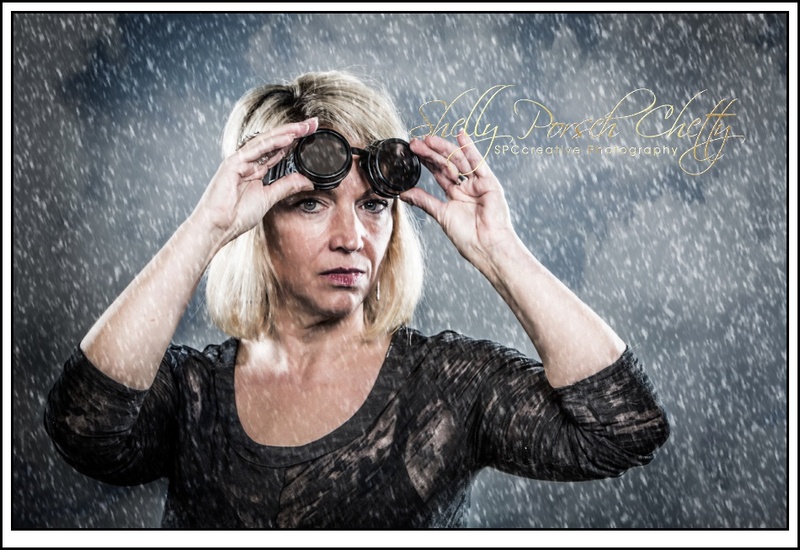 We HAD to play with an aviation theme which quickly morphed into a stormy weather related series. Next came Carole. She is known for keeping a room full of young ninja wannabees under control and focused. She owns Fort Bend Tae Kwon Do. You don’t want to mess with this gal — EVER — but you can send your kids to her so that nobody will mess with them either. Giving kids the tools to become empowered. Whether it’s with her creative personality or with actual electricity, Miriam, owner of Southern Voltage Electric Service will electrify you. She’ll also make sure your house doesn’t burn down for the lack of good wiring. I stopped waiting for the light at the end of the tunnel and lit that b!7ch myself. And Bobbe, beautiful Bobbe. As moms of boys more than a decade ago, we shared many afternoons centered around laser tag and nerf guns and carpools. Those boys are now amazing grown men. And Bobbe hasn’t slowed down, nor does she plan to. 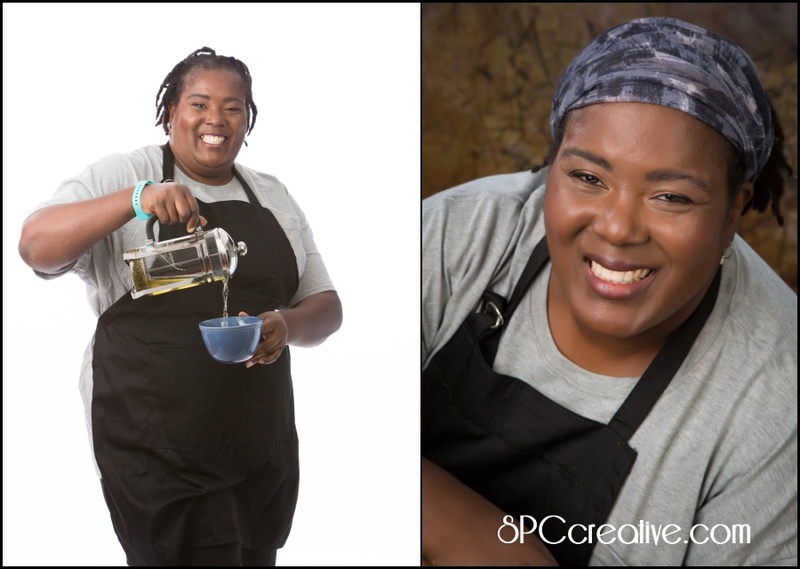 How about gathering up four or five of your powerful women friends to unleash and reveal their super powers with SPCcreative Photography? Contact me at the studio for details and to set up a celebration of power. My latest project came out of a lousy Post- Hurricane Harvey Funk several several months after the main event. No real back story here. No poor me because my house and studio backlot are all in a shambles or because my studio is basically shut down due to the eminent domain of our salvaged personal property. No bashing of our mortgage company for their horrendous red-tape policies and very-poorly run insurance claims department — Not even though I’d like to. Anyway, I could feel my inner bad @$$ boiling to the surface. Okay, she exploded through a series of raging phone calls and near meltdowns. She wasn’t pretty, and in fact it was making me physically ill to hold her in so I decided to redeem her. Release her. Let her fly. With the help of my Favorite Boyfriend, the one that I married 21 years ago, I set up a simple gray paper backdrop in a front room of our empty downstairs. Then we dug out lights from the studio-turned-storage room and dragged them downstairs only to remember that we had NO ELECTRICAL OUTLETS below four feet. RATS! “NEVER FEAR — EXTENSION CORD MAN IS HERE!” shouted FBF as he strung a heavy-duty cord and power strip over the stair rail and through our entry hall. Then, nothing happened. Nothing at all until a few days later. That’s when I dressed in black, applied my Jet-Set-Red-Bad-Girl-Lipstick and a vampy eye then recruited FBF to help direct my poses and click the shutter. When I shared these pictures on facebook and instagram, the response was amazing! 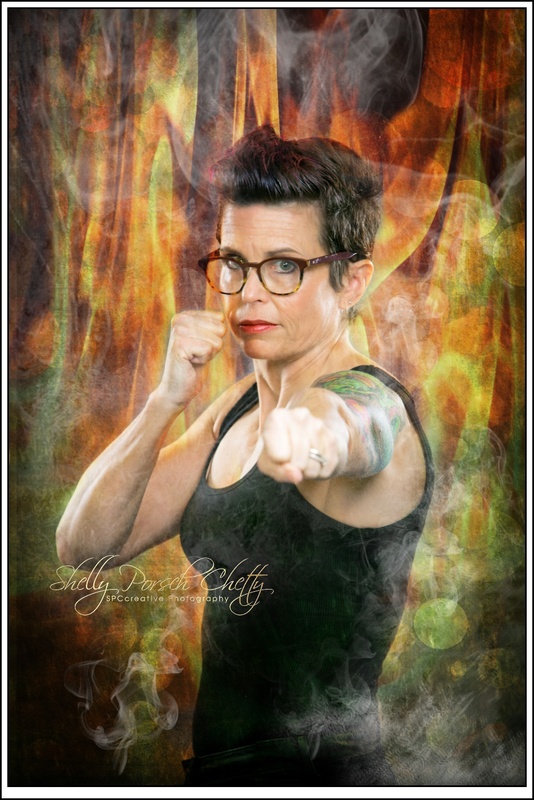 Maybe other women would like to capture their own super power in portraits too! SO… I put out a call to a few special friends. First to respond, Michi! YOW, she showed up with a black latex catsuit, killer boots, and accessories. With her wicked-bad makeup skills she actually painted the black mask on her own face. Of course we couldn’t possibly resist adding my black cat, Pearl to the mix. She TOTALLY ROCKED it! Don’t you agree? Next up, the beautiful mother-daughter duo of Maria and Maddie Grace came in. Oh how I love these two. All I had to say was black clothes, red lipstick, BRING IT! and they were at my doorstep. Maria has transformed her life from ashes to beauty. — Well, actually she’s been beautiful all along, but this woman has definitely walked through fire in the last few years. She makes broken look beautiful and strong look invincible. She walked with the universe on her shoulders and made it look like a pair of wings. Maddie Grace is the quiet one, the gentle one. She mysteriously appears, and when she does — things happen. She has the mindset of a queen and the heart of a warrior. She is everything all at once and too much for anyone who doesn’t deserve her. STAY TOONED for some more amazing and gorgeous Inner Superheroes Revealed in our next blog post. Same Bat Time. Same Bat Channel. Would you and your friends like to reveal YOUR inner SUPERHEROS? It’s fun and it’s empow-HER-ing. I’m loving this project and hope that you are too. 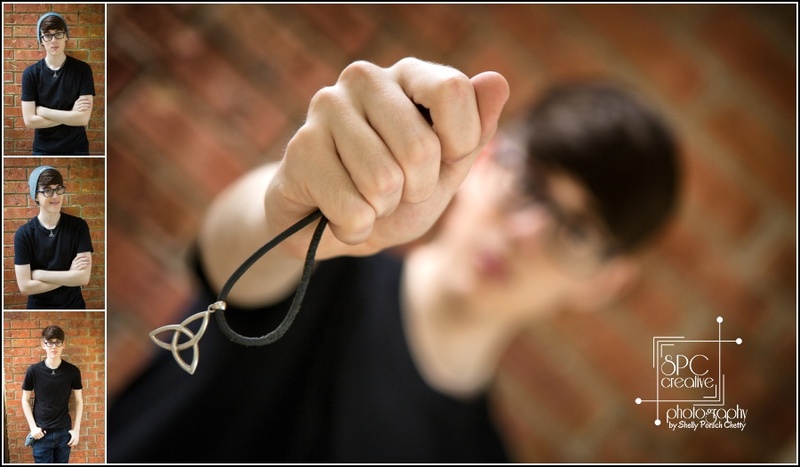 Let’s name your superpower and showcase it for the world to see! Contact me today. Here’s what I remember from the first time I ever met Jennifer Boisvert. I had just started dipping my toes into whole concept of business networking activities. For the uninitiated, there’s a whole subculture of networking in the small business community and it is amazing. Events are usually centered around a meal or a happy hour where groups of people from different professions gather to share information about themselves and their businesses. Occasionally someone closes a sale with a new contact, but more often than not it’s the ongoing cultivation of relationships and connections that keep us coming back. These ever evolving relationships open doors and opportunities, but for an introvert like me, getting to that point is more than just a little bit out of our comfortable box. Seriously, I think this was the first networking meeting of any sort that I EVER attended. Women Helping Women 2 Network was a brand new fledgling group at the time. I didn’t know a soul in the room. I didn’t know what to expect, but I had made up my mind to put myself out there with a goal of meeting just two or three people by the end of the luncheon. Baby steps, right? What I really wanted was to quietly escape from the room, run for the safety of my car, and not have to worry about remembering names of people I had just met, presenting a memorable 30 second commercial, or (flash back to junior high) FIT IN. But there was no escaping. I had already committed to stay. And through the door flies this charismatic, ebullient red-headed tornado in the most perfect emerald green a-line dress I had ever seen. Her personality filled the room and busted out the windows, raining down on everyone present like super-powered glitter. I was in total awe. We started talking, and within minutes I felt comfortable in a room full of strangers — as if I could possibly actually make it through the meeting and even enjoy it. Fast forward about two and a half years. 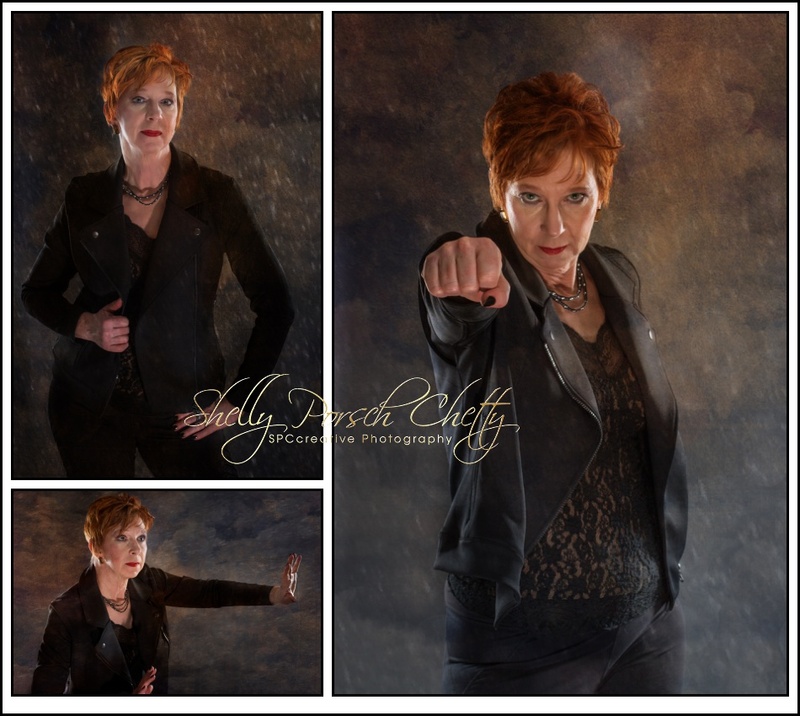 That fiery tornado of a woman chose MY studio for her personal branding portrait session. When she arrived along with Andrea, her childhood friend who was visiting from Canada, we carried in loads and loads and LOADS of clothes. I wouldn’t have expected less. 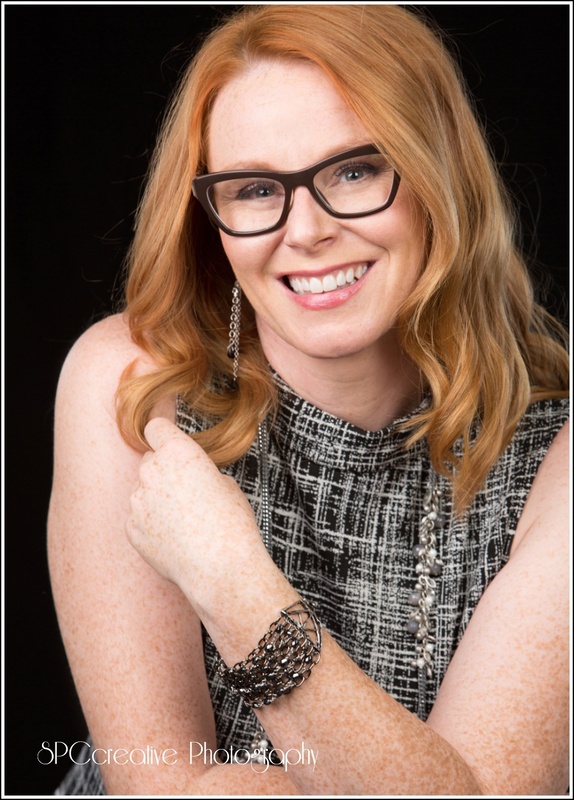 After all, Jennifer is a fabulous stylist and image consultant and also a managing partner with J. Hilburn, a luxury line of custom mens’ clothing. She has also been named one of the best Personal Stylists & Shoppers by CBS Houston. 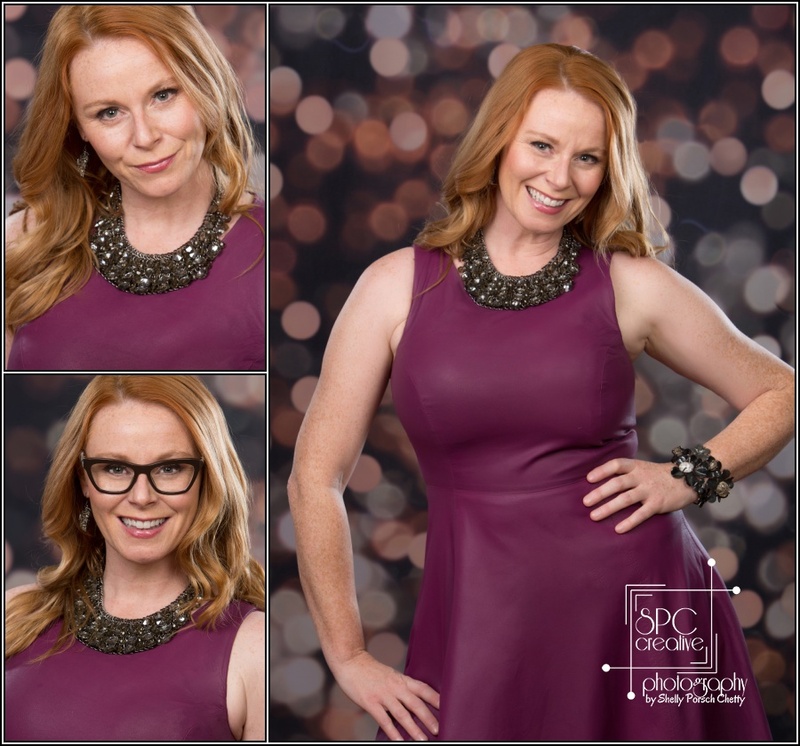 We can all use a helping hand with our personal image, so CLICK HERE to learn more and start spiffing up YOUR image with Jennifer’s help. 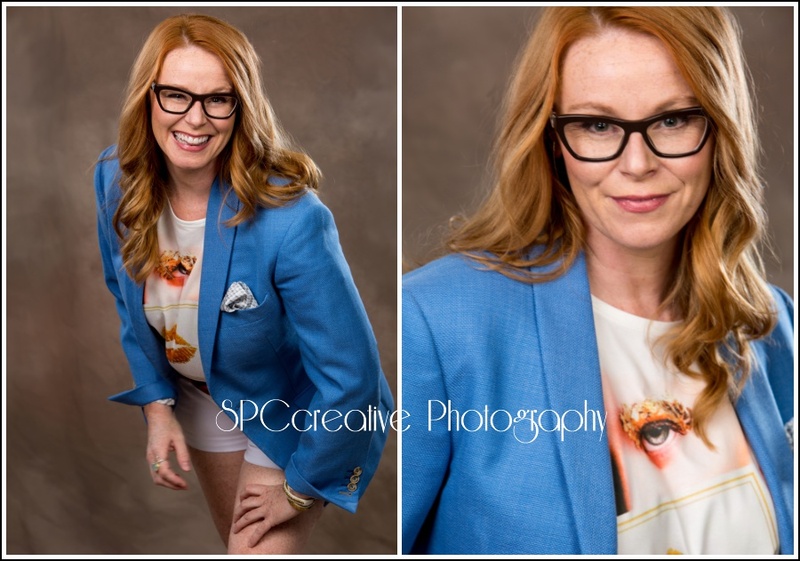 An amazing anchor to many of our branding portrait sessions is Brandie Seifert, founder of Hollywood Hippie Cosmetics. 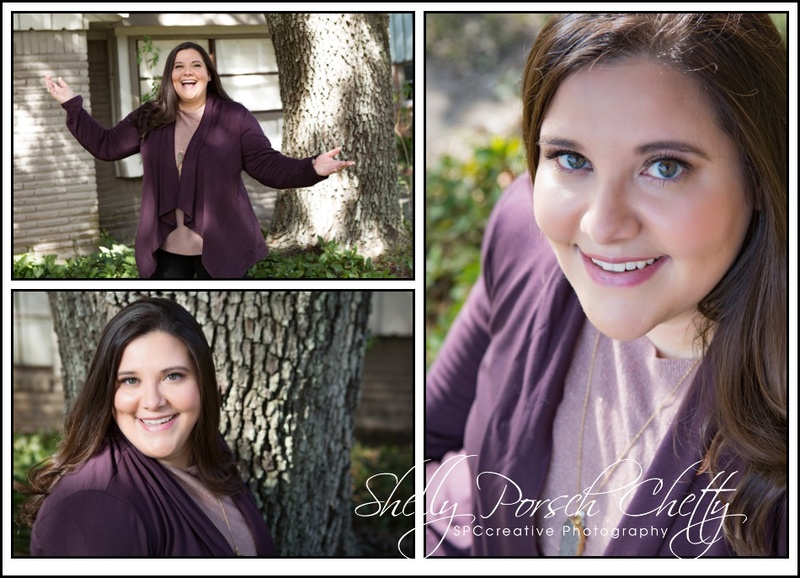 The talented and oh-so-adorable Brandie always provides just je ne sais quois with her professional makeup application and hair styling in-studio. 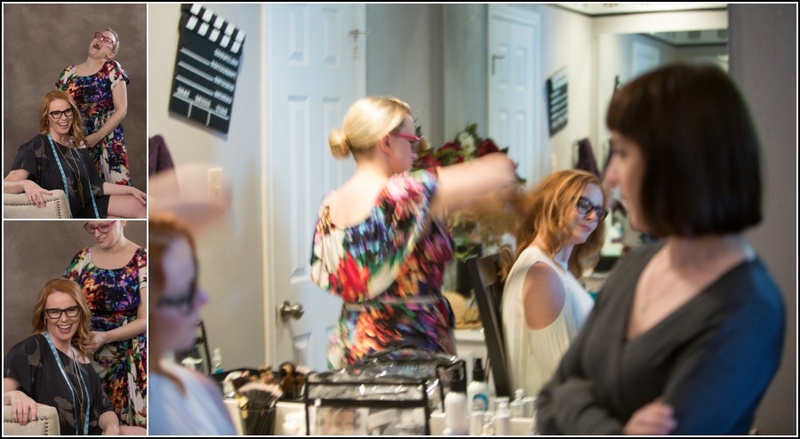 She makes everyone look great, and our time with Jennifer was one of the most fun EVER! 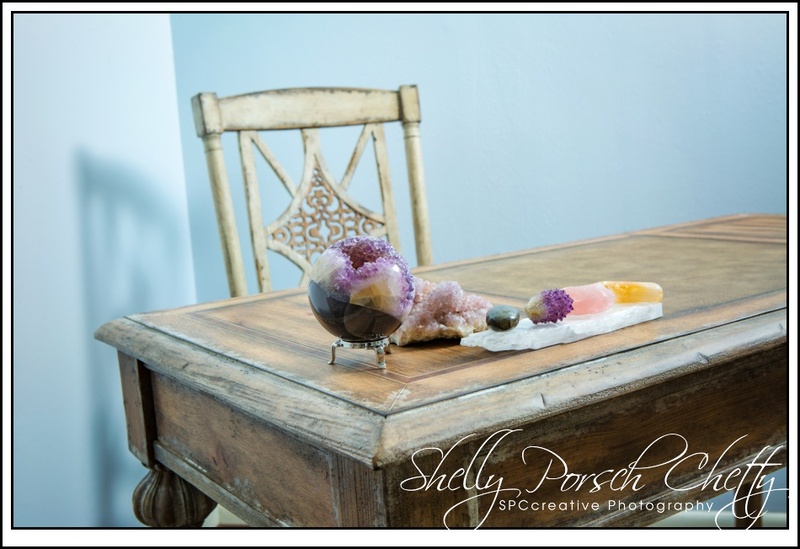 Another special friend and colleague, Suzanne Joffrion with esbe Designs met with Jennifer before our session to provide the gorgeous jewelry assortment you’ll see in these photographs. And to think — I would not know any of these women if I had not become involved in the professional networking activities that are available in my community, specifically Women Helping Women 2 Network. 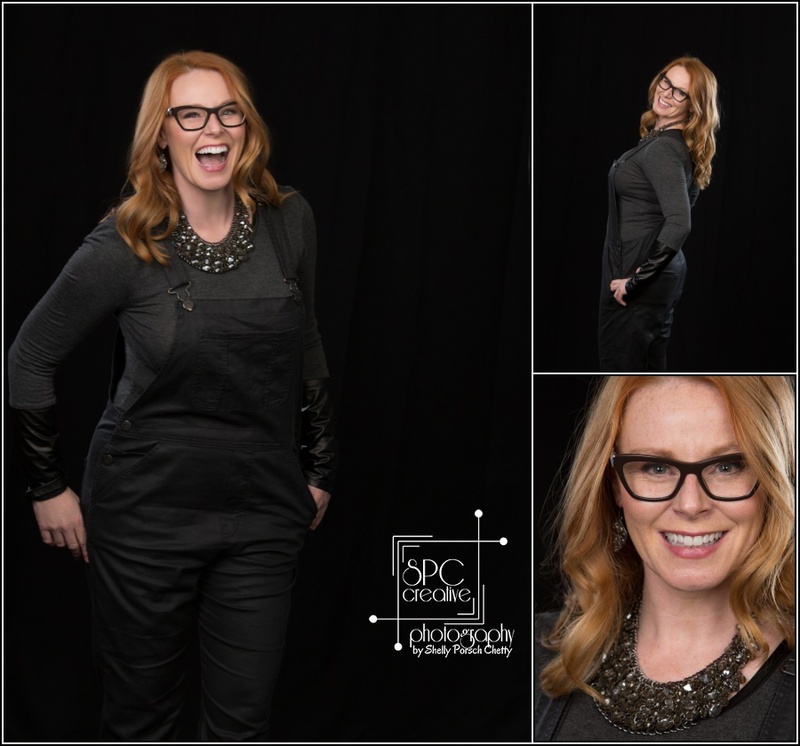 We wanted to capture Jennifer’s fun and outgoing spirit along with her elite professional brand, so we worked together as a team to create images using different outfits, poses, and expressions. Our consistent lighting style brought a cohesiveness to the overall portfolio, tying everything together beautifully. 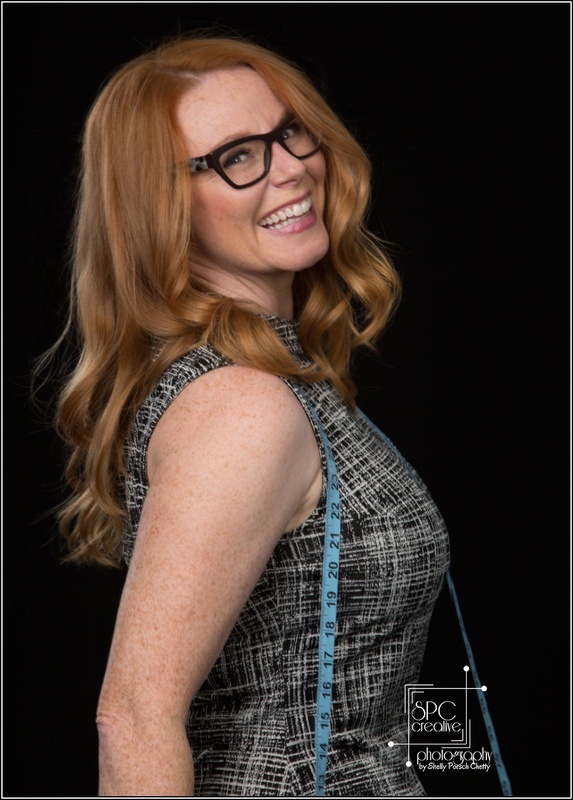 One important part of the J. Hilburn brand incorporates the blue measuring tape, a critical tool in perfecting the custom wardrobe orders for her male clients, so we made a point to include that tape in several poses throughout our session. Jennifer’s style is certainly varied — but always polished and sharp. LOVED this funky graphic tee paired with a traditional blue blazer and shorts almost as much as that gorgeous plum colored dress. Who would have thought to put something together like that? Jennifer did. That’s who. No doubt about it, Demi has quite a presence in front of the camera. Is she not a gorgeous STUNNER?! Well, look out world because here she comes. 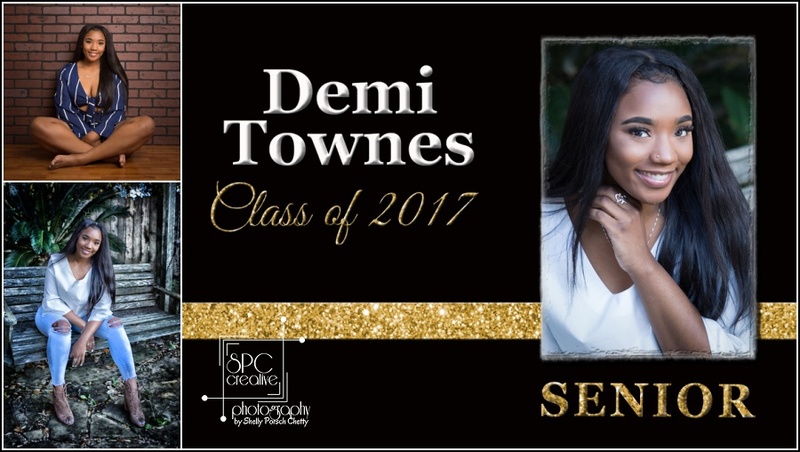 Demi and her classmates from Foster High School will cross the stage to receive their diplomas this Saturday in what is sure to be a celebration-filled evening. I loved working with her, and had to laugh when we were designing her graduation announcement. Let me tell you, this young woman knows exactly what she wants and how to get it. As most of you know, my graduation announcements are totally customized for each student. We choose colors, overall feel, fonts, images… EVERYTHING to reflect the student’s personal style. No cookie-cutter announcements over here! Most of the time I get it right – straight out of the chute with maybe a minor tweak. Not this time! Well, the black background could stay… and the wording was good… and the image selections had already been decided. BUT, I totally missed the boat on everything else. That COULD have gone very wrong, but not with Demi. She sent back her change requests, right down to the exact type style that she wanted. Really? Nobody’s ever done that before! BUT — we do offer a custom product, and that’s what we provide — satisfaction guaranteed. We made the changes she asked for — type-style, adding glitter to the school color gold, changing the overall layout exactly as she specified, and then everything just fell into place. She loved the end result. That’s what I like. Someone who knows what she wants and isn’t afraid to ask for it. I will admit that I had to swallow my pride a little bit, but it wasn’t too difficult at all because she was so very specific about how she wanted her announcement to appear. 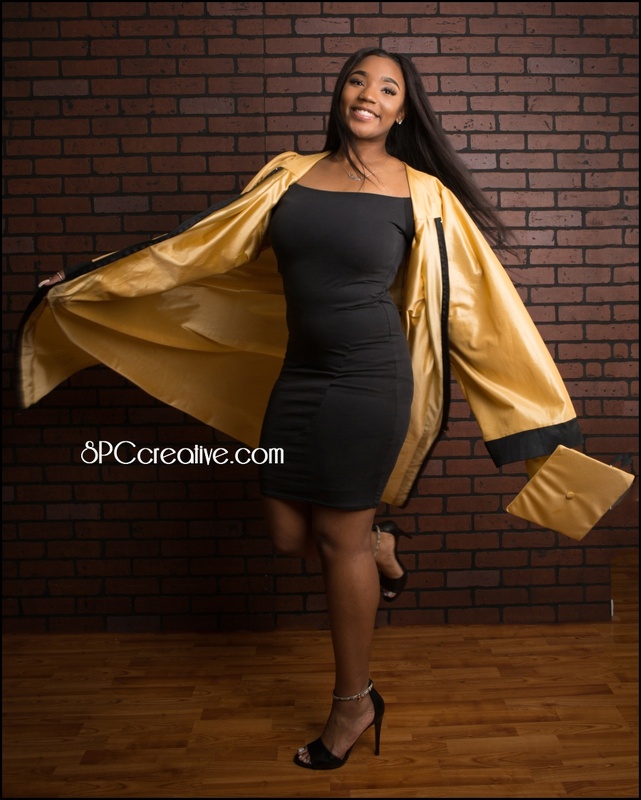 After Graduation, Demi will attend Prairie View A&M where she plans to continue her studies and enter the field of nursing. Congratulations on your graduation, Demi! Have a great time celebrating and reach for the stars. You’re already on target to achieve so very much. 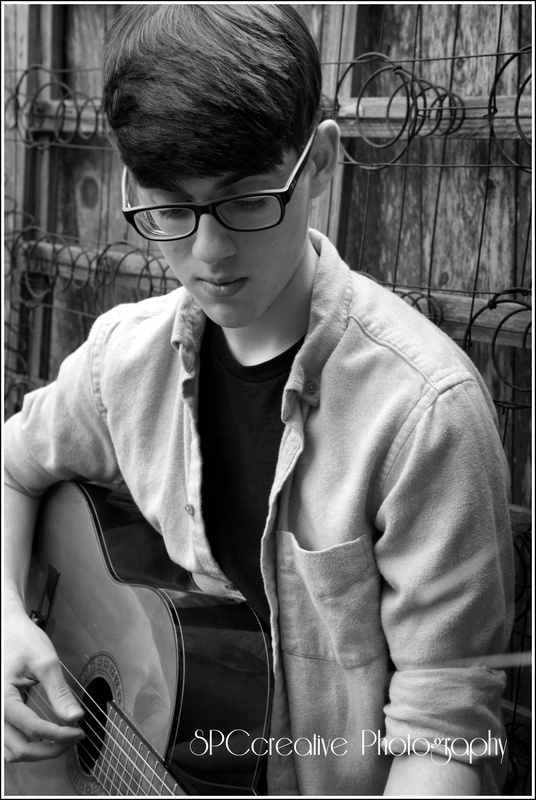 Gamer, Guitar Player, Future Veterinarian. 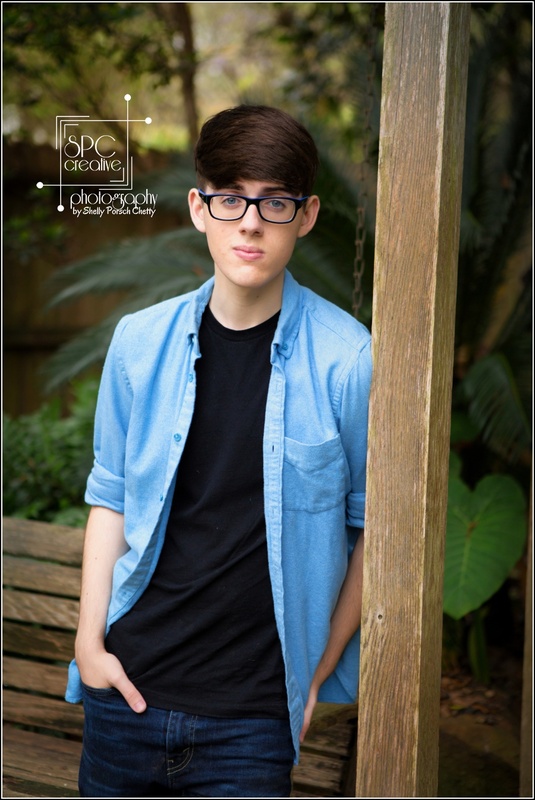 He’s a laid-back, casual easygoing sort of a guy who’s just about ready to walk the stage and collect his diploma from Bellaire High School. 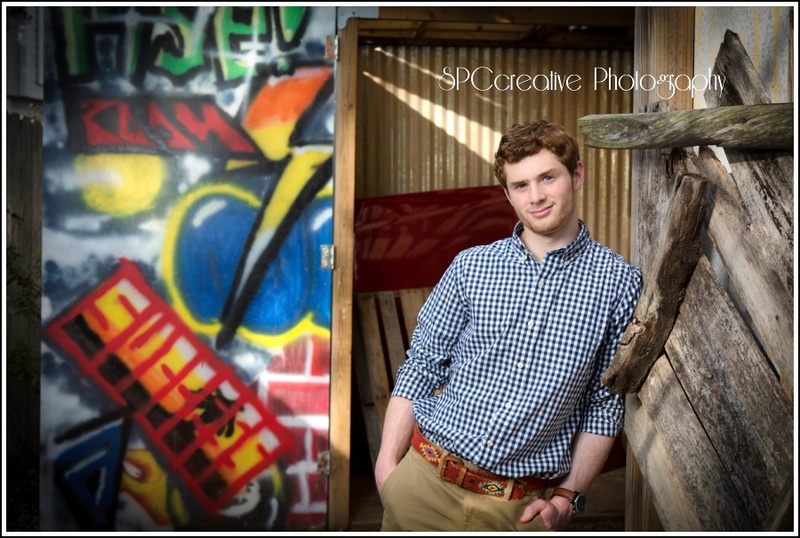 I loved his easygoing attitude about our portrait session together. With an air of relaxed confidence, he was super personable and seemed very comfortable in his own skin, up for anything. 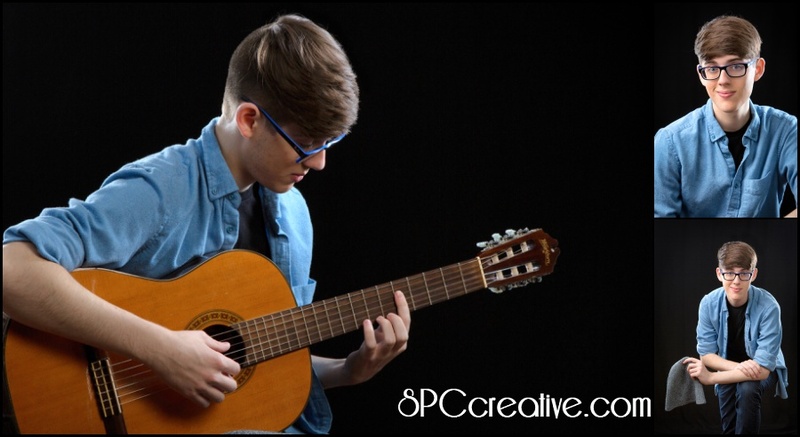 In his spare time, he enjoys listening to music and playing video games, but as a member of the Guitar Honors Orchestra at his school, Valen is quite a talented musician in his own right. Guitar Honors Orchestra! I didn’t even know such an ensemble existed. How cool is that? And on the weekends, he volunteers at Gulf Coast Veterinary Specialists. That place is super special to me and my family because they played a huge role in saving the life of our Grand Dane a few years back. Grand Dane… That’s what we call our Grand-dog who happens to be a Great Dane. Through this work, Valen has become very comfortable working with all sorts of animals. This internship is setting a great road for him. 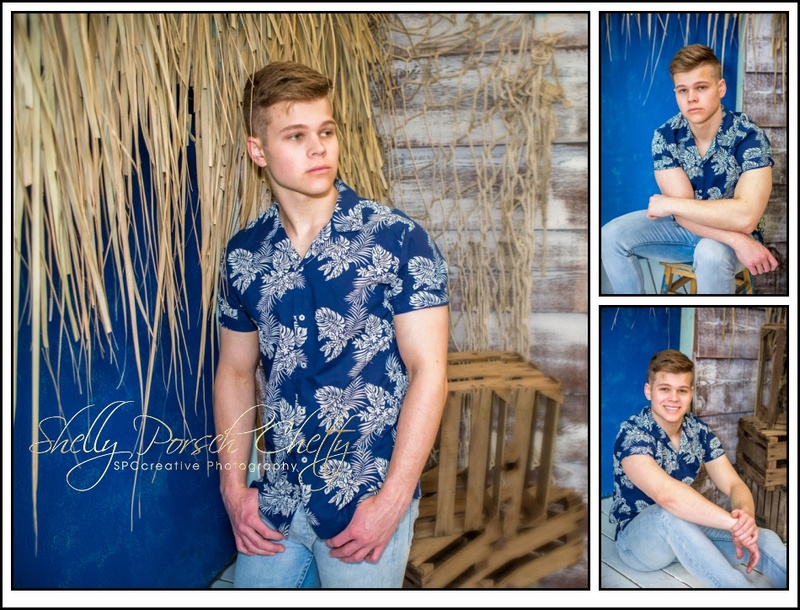 After graduation he plans to study biomedical engineering as an undergrad, and then turn toward something in the veterinary field, possibly even specializing in exotic animals. 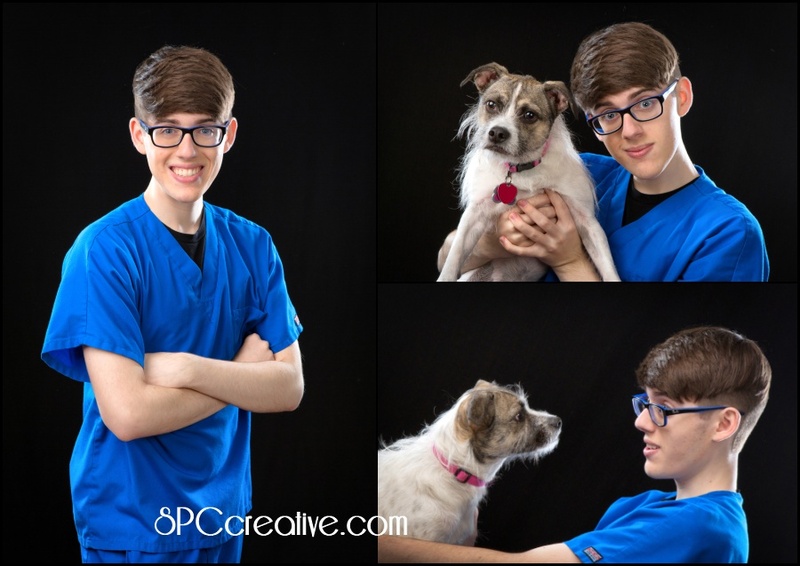 I was so glad that he brought his scrubs and his pup, Kaley, along to his session. She is one of the cutest dogs I’ve seen in a long time and it’s obvious that she adores him. Looks like the feeling is mutual too. Congratulations, Valen on your graduation as a part of the outstanding Class of 2017. We’ll be watching for big things in the years to come. This girl learned something new the other day, so I’m going to share it with you. Did you know that the art of reading tea leaves is called TASSEOGRAPHY? I didn’t, but it completely makes sense. After all, Tasse means “cup” in German, French, and probably about a bazillion other languages, and of course -graphy is the Greek word for writing. Oh my goodness, what a time we had. The tea was fresh pressed; the laughter, heart-felt; and the spirit, sincere. LaShan is the proprietress of a culinary treasure-trove called Three Lumps of Sugar. 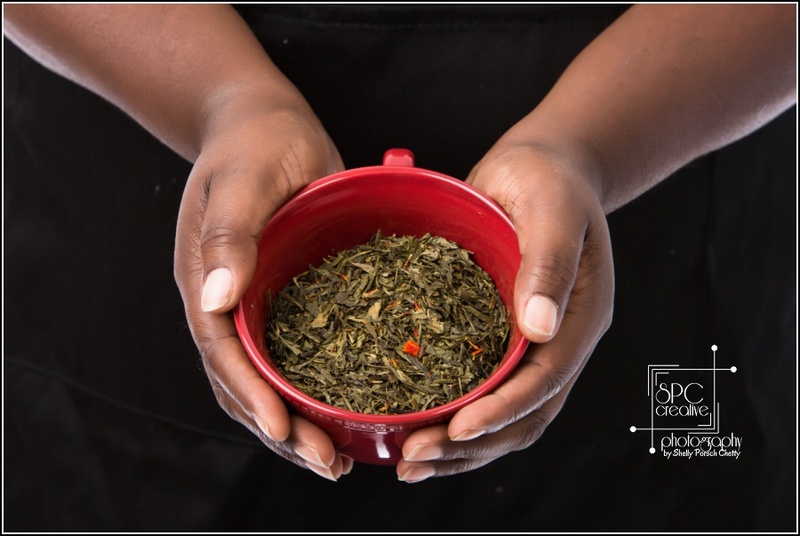 She mixes and markets fresh blends of loose-leaf tea, spices, and artisan sugars and salts for creative cooks and bartenders. 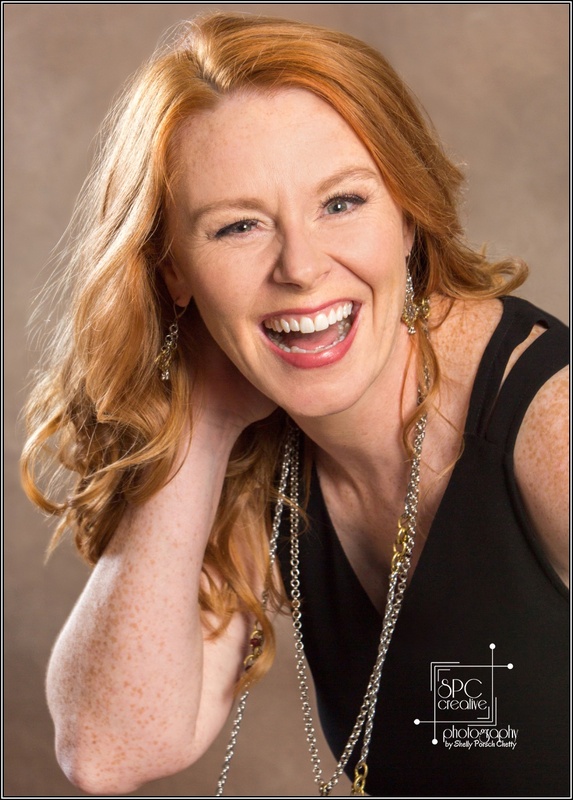 To kick things off, she needed a new headshot and we leveraged her session to the next level. 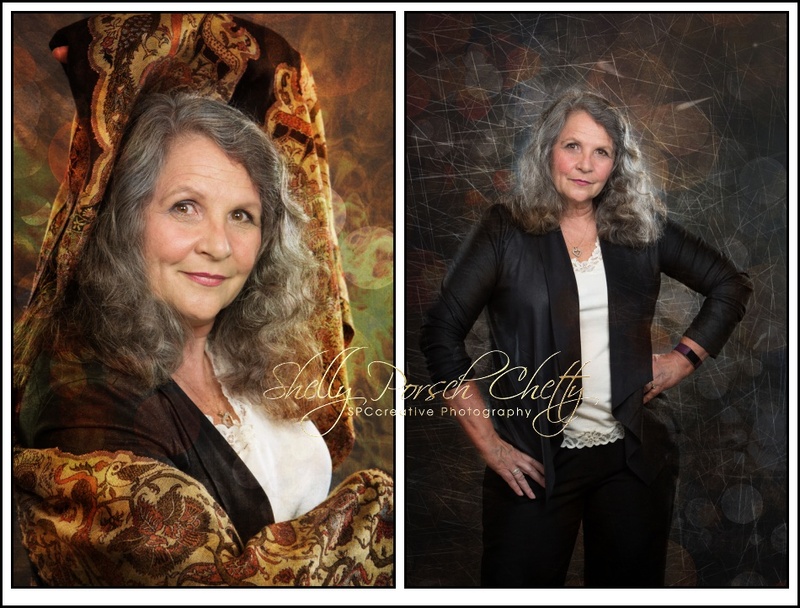 While staying true to her personality and style, we created a lovely variety of story-telling images that she can use in her social media, website, marketing materials and more. And we had a great time doing it. “We’ve all heard the expression, “A picture is worth a thousand words”. As an entrepreneur, building a brand is crucial. Customers respond not only to your products, but also to you as the business owner. The business really is an extension of you and your imaging conveys a lot. 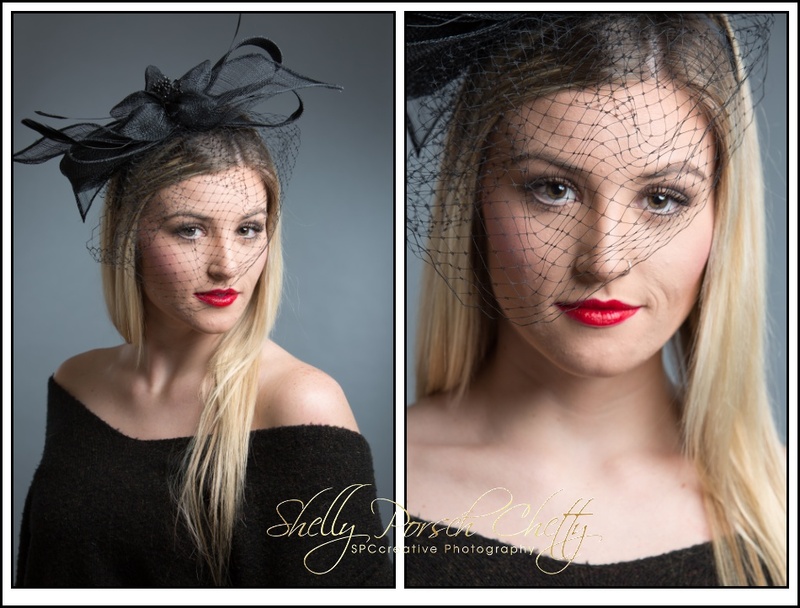 I was so pleased to work with Shelly. She managed to capture the true essence of who I am and what my company means to me. Both my company and I are fun, playful, and creative. I think my pictures say exactly that without any words at all. At Three Lumps of Sugar we create and sell teas, spices, and artisan sugars and salts for bartending. Our images need to appeal to those who would purchase our products. Thank you, LaShan, for trusting me with your image and for the very kind words. I can’t wait to sample the whole line of your yummy concoctions very soon. 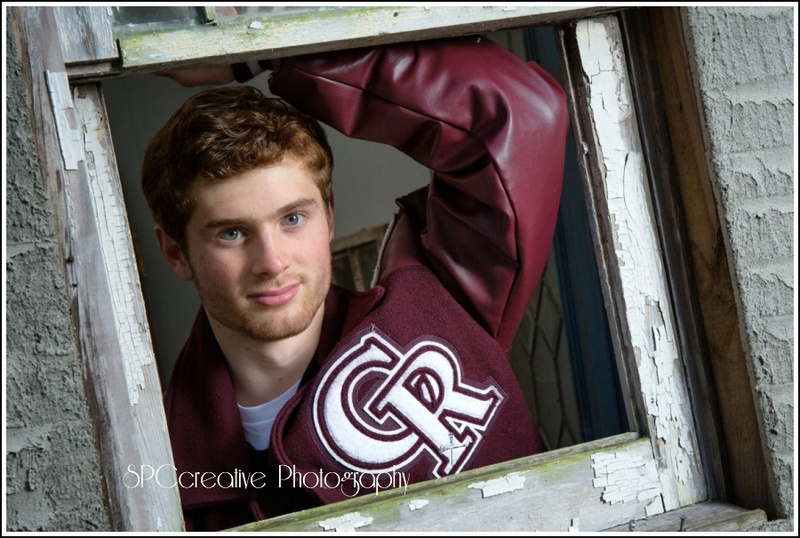 This is Garrett — Class of 2017 at Cinco Ranch High School. 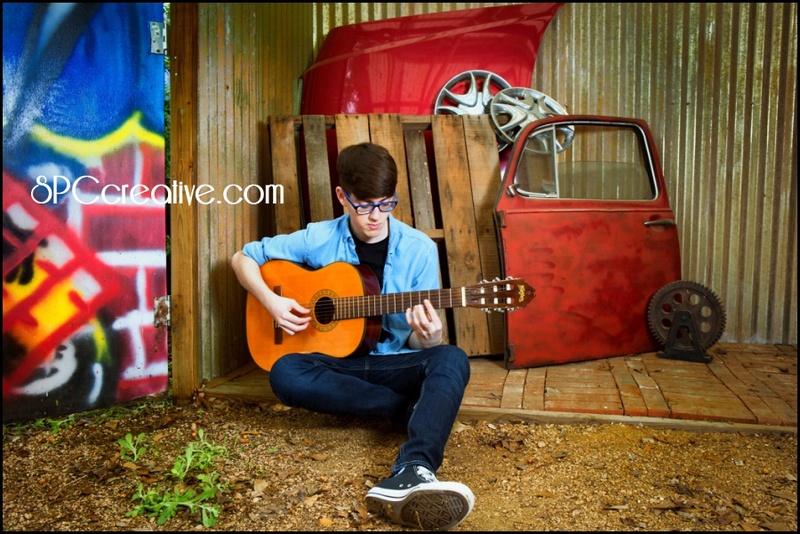 When we initially set up his Senior Portrait session, I knew right away that photographing him with his shiny red pickup truck would become a major part of our plan. He showed up and there wasn’t a speck of dust on that vehicle. If his mom hadn’t told me during our pre-session planning consultation that he and his friends love to take it out mudding, I never would have guessed it. That mudding sounds like so much fun! I really wish I could have gone along to experience the adrenaline-rush they talked about, but we kept the vehicle clean during our time together. 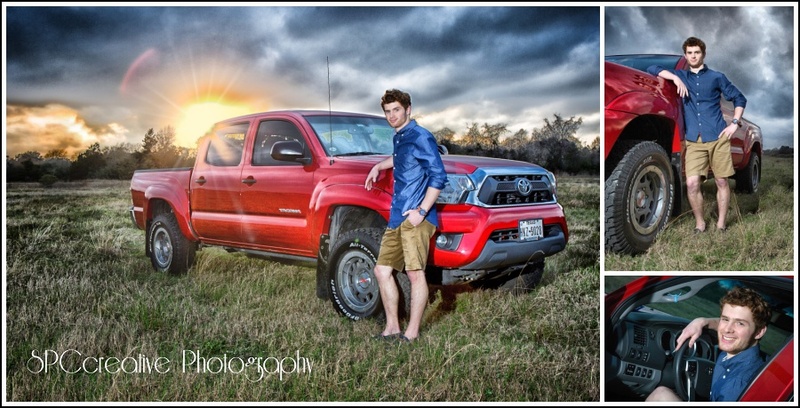 We saved the truck for the end of our session so that we’d stand the chances of a good sunset or at least low, directional sunlight — and when we saw that angry cloudy sky, we knew we were in for a killer perfect image — and we certainly got it. 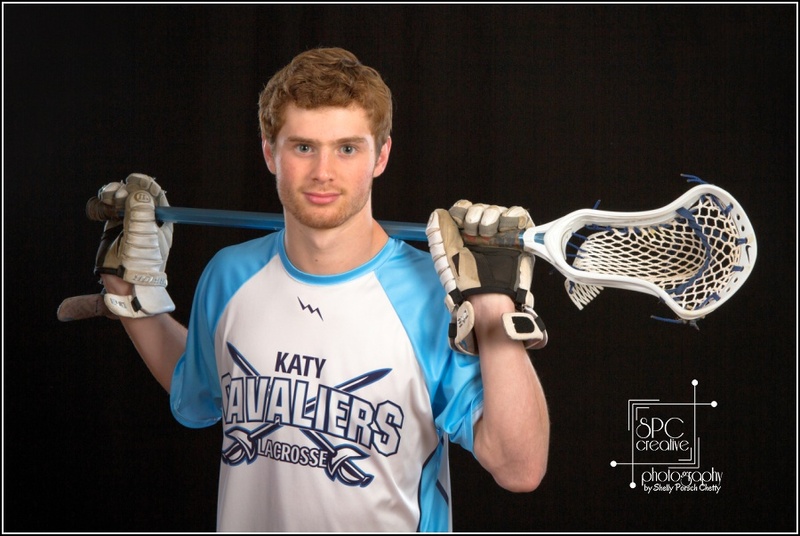 Garrett’s also an accomplished athlete who has enjoyed playing LaCrosse with the Katy Cavaliers for the past seven seasons. And he’s smart too. 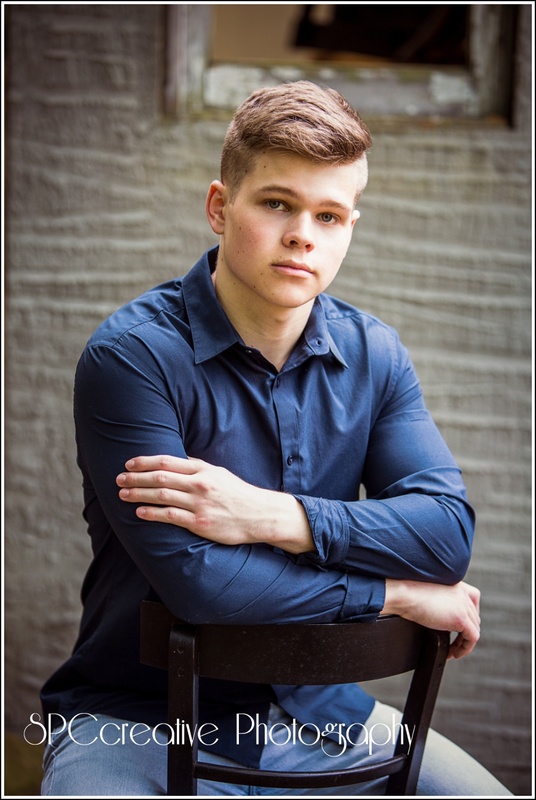 With National Honor Society membership credentials to his name, he’s looking to study Mechanical Engineering in Colorado after graduation. 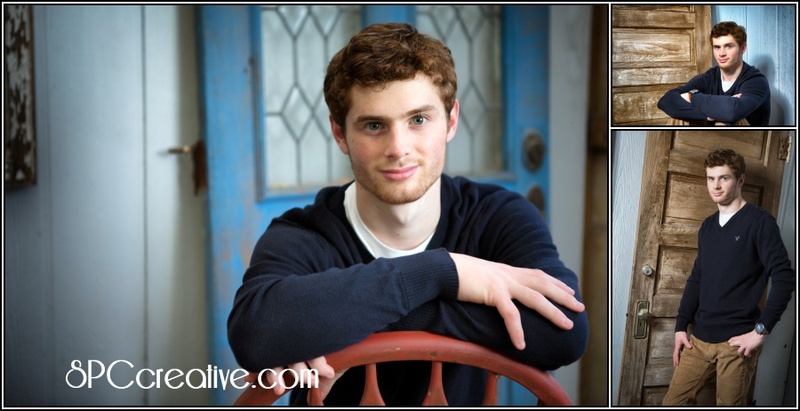 For fun, he also enjoys snow skiing, water skiing, hiking, and riding his dirt bike on trails. He and his friends like to wrap up their fun adventure-filled days building bonfires and just hanging out. Congratulations on your upcoming graduation, Garrett. 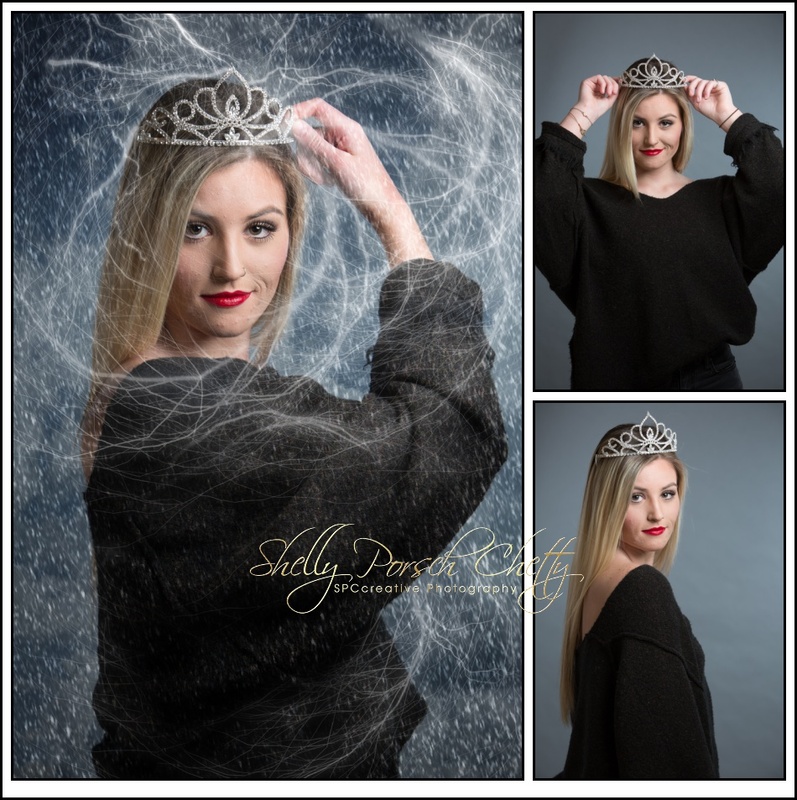 I have thoroughly enjoyed photographing you and getting to know you and your mom this year. Send me a post-card when you get to Colorado, won’t you?